Callum Innes, Exposed Painting Paris Blue, 2018, oil on linen. Image courtesy the artist and Ingleby Gallery. This spring Callum Innes will present the inaugural exhibition at the new Ingleby Gallery in Edinburgh. Opening on the 12 May 2018, the exhibition presents a new series of works by the Scottish artist, created specifically with the new space in mind. The exhibition marks the 20th anniversary of one of the UK's most distinctive commercial art galleries, and fittingly Innes took part in the gallery's very first exhibition in 1998. This ambitious solo exhibition presents a new series of large-scale 'Exposed Paintings', which explore the possibilities of the colour blue. Often described as his signature works, the Exposed Paintings explore the subtle interplay of addition and subtraction by layering and removing pigment on the canvas. 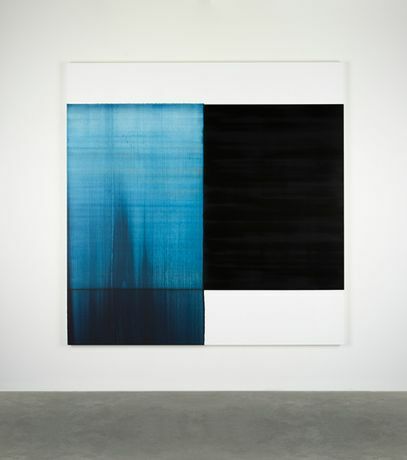 Callum Innes explains: "People often describe my work as 'unpainting', which I don't really like, it is painting, I'm applying colour and pigment all the time, and I am removing it, but leaving the remnants of each layer". Innes' process, in which the controlled hand of the artist is balanced by the potential chaos of chance, has come to define a new and significant language of abstraction. As he puts it "they are all quite different from one another, though the language remains the same. The paintings should retain a sort of human fragility about them". Innes' works will be displayed in the magnificent glass-domed hall at the centre of the new gallery – a striking and unique environment in which to exhibit the artist's paintings, which are about light and luminosity. The new premises mark the next phase of the Ingleby's longstanding commitment and support of the vibrant Scottish visual arts scene. Set in a historic former Meeting House of the Glasite Church on Barony Street, the austere, yet beautiful building dates from 1834. For the past thirty years the building has been cared for by the Architectural Association of Scotland, and the Scottish Historic Buildings Trust but the magnificent main hall has lain empty. It has been restored and refurbished by Helen Lucas Architects, working alongside the SHBT, and Edinburgh World Heritage, to create an unrivalled contemporary gallery that preserves and celebrates the essential character of the original building. Upstairs, in the former feasting room, an exhibition celebrating twenty years of Ingleby Gallery will present new works by many key artists associated with the gallery's history, including Sean Scully, Ellsworth Kelly, Howard Hodgkin, Ian Hamilton Finlay, Katie Paterson, Peter Liversidge, Jonathan Owen, Alison Watt and Susan Derges.